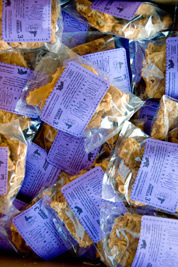 I have been making my praline candy for over 30 years, which we loved in my home town of New Orleans. I had plenty of time to perfect the recipe from my cell in Angola Penitentiary. I created a make shift kitchen from a stove made out of coke cans and burnt toilet paper rolls to get heat. My friend ‘Cap Pistol,’ who was worked in the prison kitchen, taught me how to make sugar candy and I gave them away, especially to the guys on death row. Since my freedom I set up a candy company and have been making and selling praline candies which I called “Freelines”. 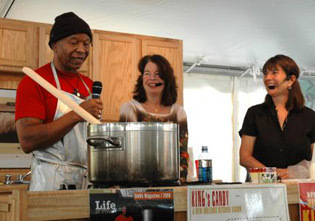 They not only taste great but also enable me to tell the story of the Angola 3. Go to PayPal to order your freelines now. Please contact us directly for orders of more than 10 bags. In a huge pot put all ingredients except pecans. Heat on a high fire, stirring continually so the mixture doesn’t boil over. Stir until the mixture is a caramel. Using a spoon, whip the mixture. “Talk to it, show love to it,” says Robert. Either leave completed mixture in sheet pan to cool entirely, or before it’s fully whipped, use a spoon to remove the mixture into smaller rounds, placing them on a second sheet covered in wax paper. Robert warns that “candy has a mind of its own” and varying temperature and humidity can effect the result. Makes 25 3 1/2-ounce pieces.